I've got an idea for a tutorial on setting up and publishing a comic page. 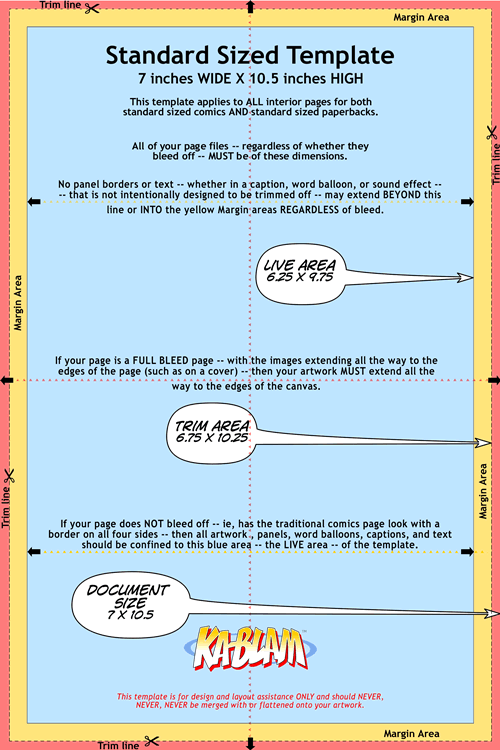 Here is Ka-Blam's 'Template' for doing artwork with bleed and trim guidelines. They are digital printers who specialise in comic books. It would be good idea if your professional Design and Photo tutorial team (they do the best tutorials I've ever watched!) could do a tutorial based on setting up this comic page print guide for Affinity Publisher. It would be a great road test for Affinity Publisher in Beta...as it would show Publisher's capabilities on an actual 'print' job set up. Once the page is set up with guide lines...all that would remain would be to drop in the page of comic art at the size noted in the 'live', 'trim' and 'document' sizes.) This would be a good way to get many independent creators on board with your pending release through the powerful & accessible medium of comics. The original file/template is on their website. There are a lot of comics companies and comic artists who probably use Affinity Design, Photo (I do...) and now, Publisher. Having a 'press-press' tutorial for this template would be great. From my own perspective, would really help me learn Publisher in Beta in a context of how I would actually use it. Ps. Here's the link to the template. Included a link to the website, comic page template and uploaded (correctly this time I hope?) the template.